Well, clearly Time Gets Away from us here on the farm. So many things happening at once that we have all been spinning. I definitely THOUGHT about writing for the blog, I really did. But time gets away from me faster than I can catch it; faster than the two grandkids now that they are both up and running around on their own. Still, we have managed to get things done, so let's see if I can at least run THAT down for you. I hope everyone knows that most Small Family Farms actually rely in large part on income OFF the farm to support the Family part. Some farms make money, but my bet is that most don't in their first 8 years. Farmers aren't stupid and understand that a bad season can wipe you out if you don't have a backup plan. Where we are hedging our farm bet is with Maddrey busting her tail to get through nursing school - no small feat - AND she's doing great. It does mean some farm projects will take longer to develop and complete, but it also means we will be able to pay our bills more easily once she graduates. But she is ALSO getting our horses back to work and you could probably schedule a horsemanship/riding lesson if you tried. She's worth it. AND she will be producing some 100%-from-our-own-sheep roving for sale at some point soon. Frank is developing a nice equine dentistry clientele with wildly satisfied customers. (You can message him on Facebook for an appointment). But he is also looking at another long summer of haying, which provides food for our animals through the year and some extra to sell when we're lucky - so there's a third hedge to our farm bet. He's expanded that business every year and we are always looking for new fields, if you're within tractor-roading range. On my end, I'm looking at a collection of Cottage Industry efforts. First, I was invited to contribute to a lovely book, recently published - actually, it's a TERRIFIC book. Titled SisterWriterEaters, it is a collection of very personal essays and recipes, told by an amazing cast of talented women, edited by a pair of even more amazingly talented (and funny) women. Worth the bother to buy it and read it, in my humble opinion, and not just because I have an essay included in it with my mother's incredibly fabulous chocolate cake recipe. My second industry continues to be TetherMade baskets. Through the hard work of my NEW son-in-law and my daughter, we are now in about eight stores across the country, plus a few great local stores in Maine. I'll write about them in upcoming blog posts because they are really great and interesting people with adventure in their hearts! As of yesterday, I officially have a THIRD cottage industry - I'm designing repeating prints for fabric, wallpaper, giftwrap - basically Surface Pattern Design. The likelihood of my work getting licensed by any actual company is slim to none, HOWEVER with the vast powers of the Series of Tubes we call the Internet, I am able to have my designs digitally printed onto gorgeous fabric and wallpaper and sell it myself! Amazing. What a world, right? My focus is Chickens right now, because... farm with chickens made sense to me. And here is my first "Chicken Happy" offering - a gorgeous little tea towel built from my little watercolor paintings. It can either be purchased as a Fat Quarter (in their gorgeous linen/cotton canvas from Spoonflower and finish the raw edges yourself OR Buy a FINISHED tea towel directly from me (I'll pre-wash the fabric, hem the edges and tie it in a pretty bow, shipping included) for $25. So, that's it - basically a giant sales pitch, but hey, we're farmers... always growing, building, making and selling something. And with any luck, this will be me Trying Yet Again to get a good run of blog posts going. We'll see, but Hope is a Thing With Feathers... right? Thanks for listening. What's Fresher than the Farmers' Market, much less expensive and open every day? Our pick-your-own salad bar! We have mixed salad greens, sage, mint, chives or rhubarb. Next week, we will get more exciting with kale, chard and radishes. Within two weeks, we will have tomatoes and sugar snap peas. And cucumbers and dill coming in at the same time for pickles. And fresh cut flowers! Daisies, zinnias, Asters, marigolds, calendula, chamomile and more. We have successive plantings in the works, so we will keep the greens coming. June was some chicken. She was your basic beautiful Barred Rock, clucking around the hen house, until one day, she hurt her leg. Maddrey and Frank gathered her up, brought her inside, splinted her leg and gave her a quiet box in the house to heal. But June quickly became family instead. She was calm and affectionate and had a cheerful personality. Yes, a chicken can have a cheerful personality. She mostly just never got her feathers ruffled about anything. She enjoyed selfies. Clearly, she was the more photogenic of the two of us. After she healed, she was allowed to come and go as she pleased. In the morning, she would hop up onto the kitchen counter, lay an egg, and then go to the front door to be let outside to join the other "ordinary" hens. Probably to brag about her VIP access. Then, winter before last, June had a mild stroke. She hobbled around, dragging one wing, so she came back inside. We had an infant crawling around and didn't want him to do what crawling infants do - grab her or squash her - so she spent the winter in the basement, next to the woodstove or hiding under the fodder system. Warm and cozy. Safe and sound. Whenever we went downstairs to fill or stoke the stove, she would make a little conversational bok-bok-bok and help check the fire. Because she was June. And sometimes she came upstairs for a visit. Just to get some sunlight or spend a few hours on the sofa with the family. June left this physical world on the day after Valentine's Day. She stayed long enough for the love, and the flowers; then she went to sleep. We will miss her. ...he's going to want to tear stuff up. Although the same is true for Maddrey. So let's talk about tearing stuff up on the farm. First, we have acres of woods that are in serious need of tearing up. The trees here are what I would call "new growth" forest, which is much nicer than what Frank and Maddrey call them: junk, garbage, trash. The previous owners had farmed the land in their youth as it had been farmed by their family before them, but as they aged and had no one interested in taking over the labor, Nature took hold and the open pastures went back to woods. Once they had both passed away, in their nineties, their adopted son had a lumber company come in and take the best trees to help pay taxes. So what was left for us is basically an unhealthy mess. There are certainly beautiful places to wander, especially near the large stream that borders the farm, but mostly the growth is Stephen King horror story lost in the woods dense. Even midst the young junk trees, there is enough straight pine and Hackmatack to be useful for posts, lumber and firewood. However, getting it OUT of the woods is the issue. We had plans to rent some heavy equipment, but the generous offer of an exchange was made (time with our new tiller for time with his lovely old bulldozer), and we jumped. Frank was let loose first, briefly, then Maddrey took a couple of half-days and cleared a new outdoor riding arena, to go with our new indoor riding arena/barn/event center/lambing shed/hay storage/winter playground for the kids building. That girl can clean your kitchen floor with a tractor bucket and not leave a mark. 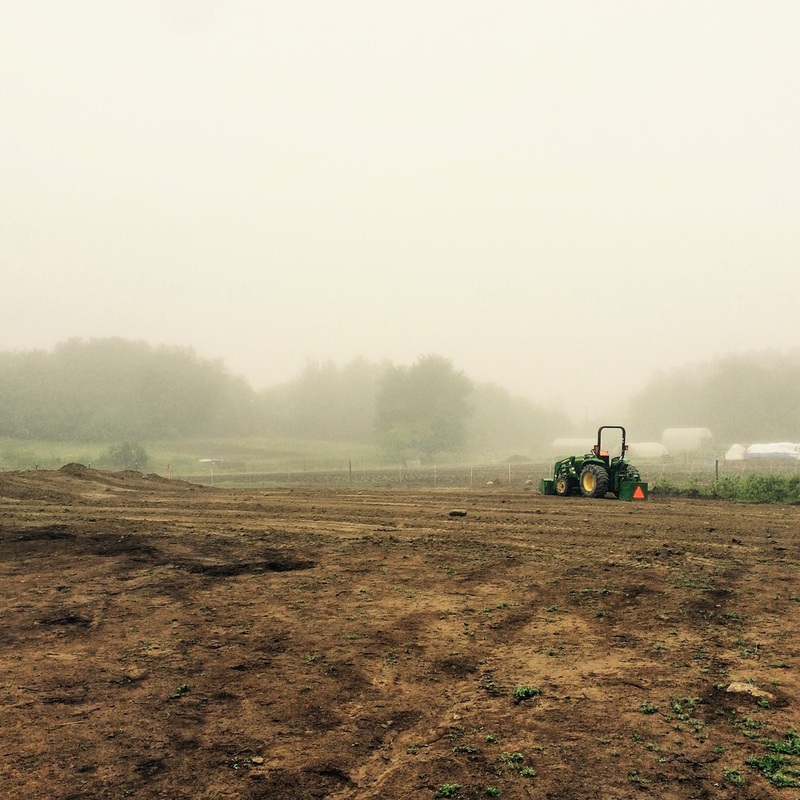 Everything is still in progress, because when you're flattening out a hillside for an arena, you want to do some work, let it rain and settle, then do some more work, and so on, until it's nice. It also gives you a clear look at how the drainage is going to work. Good drainage is pretty much essential to everything. Always. Always always. Plus, in Maine, you want to make sure you have a place for the snow to go. And this is a couple years later, looking down the slope. Frank gets a turn next and between the thousand other chores and emergencies that always interrupt his days, here's what you get for about two hours work so far. Just getting from the trailhead to the bulldozer took me about ten minutes walking. It's going to be insanely beautiful covered in snow. And by next Spring, Frank will have run the tractor through so many times, it will be beaten down into a great walking trail. And with any luck, by the time the ground freezes, we will have enough trail to drag whatever we want from the woods, whenever we need it. That's rich, in my opinion. I don't actually watch "Game of Thrones" but I hear "Winter is coming" is a big catchphrase of theirs. But for us here on the farm, it's fair warning. Winter IS coming and that sh*t is serious in Maine. But it's not here yet, so we will scurry like busy mice until it arrives. Meanwhile, there is nothing like Autumn in Maine. Everywhere you look is like a photograph. The pumpkins are ready to be stored. Or made into pies! Every little walk through the woods is a delight. And the wild apple trees are loaded down. I knock a dozen or so off for the chickens every day. An unexpected treat was discovering this little beauty on CraigsList! We have named her G.I.Jane because she is ex-military. Who doesn't want a dump truck! The sunflowers are cut and laid out to dry in the greenhouse. Oran has a major construction project in the works as well. Green tomatoes headed to become Fried Green Tomatoes! And we are pulling every last bit from the garden before the freezes hit. Now that haying is done, and we've been able to access some needed equipment, this is the month for the new building to go up. We're hoping for help from a few good friends to make quick work of it. Yes, I'm sorry, I went missing again, but I have a good excuse. I was in New York City for hip replacement surgery. You might have seen a few NYC photos on our Facebook page or Instagram. That was me, recuperating while Frank and Maddrey kept plugging along here and got more things checked off the To Done List! Oh, we were on TV on the local news - if you missed our little interview on WABI-TV, here's the link. The corn is as high as an elephant's eye! And it looks like it's climbing clear up to the sky! As long as we can keep the livestock out of the sweet corn, we'll have some for dinner and a LOT to share! And they'll get their turn when the feed corn is ready. The sunflowers are taller than we can reach and should provide a LOAD of seeds. Esmerelda, our little heifer, is growing and beautiful. We are making progress on the new building. Although we still have to put all this together! But what has focus right now is all the hay we need to mow and bale. Frank and Maddrey (and Pippa!) have been driving in circles for days and days. Makin' hay while the sun shines - and rain is coming, so they are out till well after dark. 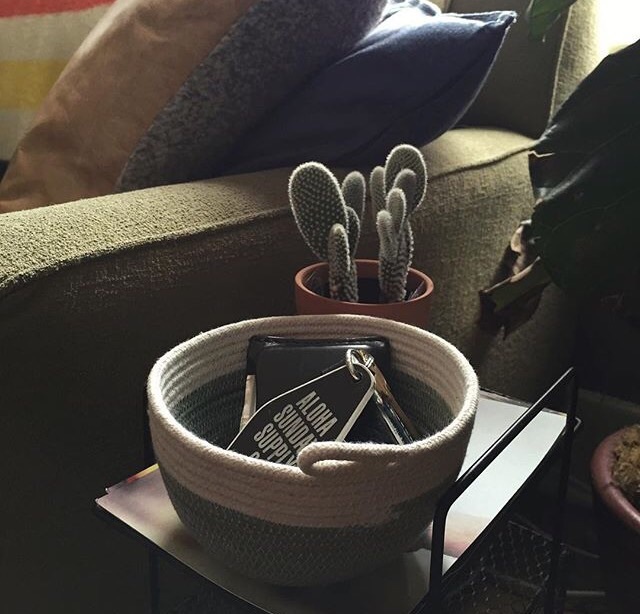 And our TetherMade baskets are now in SIX stores! But you can still order them online. More work updates to come. Hey, we were interviewed by the very delightful Taylor Kinzler from WABI TV-5 News today. We gave Taylor and Cameraman/Artist Brandon (ack, I didn't get your last name, Brandon!) a tour and shared a little bit about what we do here, what we dream of doing and such. 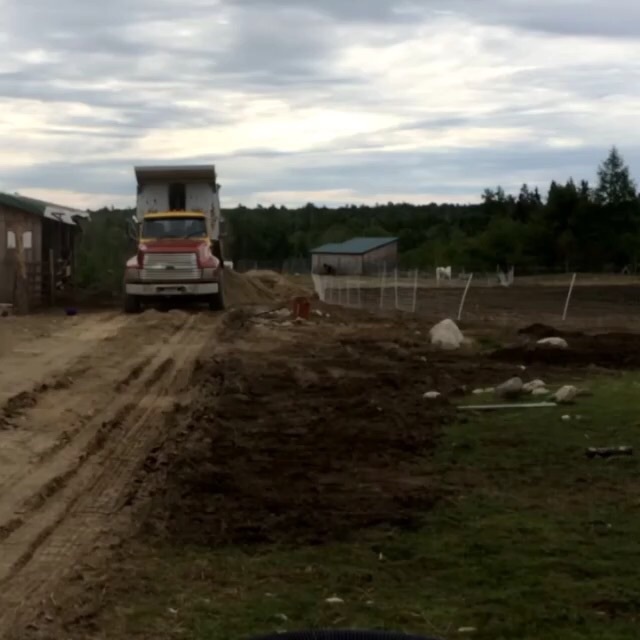 If you'd like to know more about our farm, our horses, our riding lessons, our new indoor arena, farming in Maine, whatever, please leave a comment/question and we'll do our best to answer quickly. If you have FIELDS TO MOW - you must be within 20 miles of Steuben, have MORE THAN 5 acres of GRASS (or mostly grass), and understand the deal: we mow or brushhog, depending on the quality, of the fields for free. Click on the CONTACT field (or the link here) and tell us where you are and leave us a phone number so Maddrey can get back to you. If you'd like to know more about our online store TetherMade click on the link. If you're interested in our wool roving, wool yarn, dolls, knitted items, leave us a comment and we'll hook you up. If you're interested in a writing class, let me know and we'll try to put one together. I teach creative writing "Telling Your Story" every so often, when I have a venue I like - and have worked with both adults and children. If you'd like to get a little "Farm Experience" and enjoy hard work, want to learn, have a little bit of a perfectionist streak, take instructions well, aren't allergic to animals and have some spare time, hey, Contact us! So here's the thing with farming as a small family farm operation - especially one just starting out, with pretty much zero infrastructure when we bought the place and land badly in need of care: you're not going to make any money for a while. Not only will you not MAKE any money, you'll also be PAYING OUT a lot in setting things up, buying fencing, roofing, feed. So a little something on the side that brings in some dollars can make a difference. Which is why we have joined forces with my talented daughter and her talented man and we have created this new online store TetherMade. I've been busy at the sewing machine, Maddrey has been busy hand-dying some special pieces and Michael & Bernadette have been busy creating the business, marketing and online store, taking gorgeous photos, and setting us up on Instagram (@tethermade) and Facebook. So please, check it out and see if you might want to take one home. They're kind of gorgeous, even if I do say so myself. So here's the thing, Future Farmers reading this, you're never going to have enough time. At least, that's my excuse for not posting recently and regularly. Farming isn't an 8-hour day, 40-hour-a-week job. Farmers really should get a 36-hour day and maybe a third arm. (Also mothers of young children). But here's some of what we have going on with the time we DO have: garden and hoop houses planted, new field planted (multiple varieties of corn, beans, peas, sunflowers), sheep moved and sheared (not all of them but that will get done this week), new horse shed almost done, goats producing enough milk for some very fine cheese AND keeping toddler grandson happy. I'm not even sure what else, so here's some pretty pictures. Seeding with a contraption from the 1900s. Finally got a new culvert to reduce the mud!! Okay, I'll admit it: winter beat me. I still love winter and I still love Maine, but, Lordy, this really, seriously, crazy overly-long winter got the best of me. It started off lovely and snowy and "isn't it gorgeous," but after month upon month and record-setting snowfalls and The Worst Crud-Cold-Flu-Whatever that knocked out everyone in our household, I wanted to curl up into a tiny ball of denial when it was snowing, YET AGAIN, in April. But we have had several days of warmer, sunny weather, snow is melting (and bringing mud to replace it), and the days are long enough to get things done. I will have to go back in time in some future posts for things that I missed (due to my enough-of-this-winter depression and illness), but for right now, I'll report on somewhat current events. And, with Spring actually here, there are other new babies! Our two LaMancha goats, Moonshine and Annie, have both delivered healthy kids. Moonie had twins - a buck and a little female - and they are both ridiculously cute. Annie followed two days later with her own little baby buck. Our lovely dairy cow, Josie, has also given birth to a lovely little heifer named Esmerelda. This photo is moments after she was born. The photo below is a couple of days later. We are awaiting the sheep to deliver their lambs - which could be any minute. Or tomorrow... or in a couple days. You never quite know for sure. Meanwhile, we have projects getting underway, new adventures for the summer and lots of Big Ideas. Stay tuned. After our last big snow storm, I convinced myself that I could "sense" Spring coming. This would be the LAST big snow storm of the winter. I was sure of it. I could feel it in my bones. And then it snowed the next day... And a bit more the day after. But I do still believe Spring is coming. It has to, right? And I'm sure Maddrey is feeling the same way about the baby that is coming - due in the next two weeks, the requisite nine months in the making - it HAS to come, right? At least, that's how I remember feeling when I was pregnant - a mix of "It HAS to come" and "I'm going to be pregnant for the rest of my life..."
But to give Maddrey a little break, some support from loving friends was called in by our good friend Diana, who created a Blessingway. Now strictly speaking, a Blessingway is a Navaho ritual, deeply spiritual, and filled with meaning. None of us had even heard of such a thing until we came to Maine, oddly. But the magic Google machine provided ideas for creating a ritual specific to our needs. The Mother was to feel pampered, cared for and fully supported. And I am pretty sure we got it done. There are two missing pastries because I couldn't help myself... these were fabulous. Everyone had been asked to bring a poem or any meaningful words to read, along with two beads that had special meaning. Even Great Grandma (my mother) called in from Texas to read a little poem she found and offered two freshwater pearls for the bead collection. As the words were read, handmade beads, energizing crystals, pearls, precious stones, carved beads of woman and baby, seashells with rich memories attached were each threaded onto a necklace for Maddrey to wear and draw strength from during delivery. These are our very pretty friends. As each person read their offerings, they also wrapped a bit of yarn around one wrist, eventually making a bit of a spiderweb connecting us all - the invisible connection of all women. The yarn was cut and tied - and we will each wear this little bracelet until the baby is born. For even more pampering, Diana created a delightful foot-bath with scented oils and wove a pretty flowered crown into Maddrey's hair. Oran was there to support Mommy, of course. He's such a guy. Even in the dead of winter, with six feet of snow drifted up against the doors and windows, we can still have a sunny day with friends to celebrate the coming of this New Life. So yes, Spring AND this baby are coming. I promise. Since 4 or 5 feet of snow apparently isn't enough for Mama Nature this winter, we have yet another Huge Winter Snow Storm headed our way tomorrow night, with the most recent prediction calling for another 3 feet... This requires a little bit of preparation. We bring in some extra wood for the fires, go grocery shopping for the "just in case" stuff, and get gas and diesel for the tractors and generators. Most of that stuff is done anyway. Bringing in more wood is ongoing all winter. The frustration is in having to plow and dig your way around just to get to the point where you CAN do the chores. Frank decided to put in some extra time this morning to work with one of our Haflinger ponies, Greta. He's basically RE-starting her for driving... well, for pulling, so she can help him haul logs in from the woods. Step One is catching her, which doesn't appear to be a problem. (Greta adores him) Then we hope her 'sister' Heidi doesn't get hysterical when Greta leaves the pen (she didn't). ...and there's always an audience... Yes, that's an Alpaca. Step Two is to simply walk Greta through the woods on one of the routes she'll be taking with the sled. There are carrots in every one of Frank's pockets as a reward for getting to one end or the other. Walk to Point A, get carrots. Walk to Point B, get carrots. Rough life, girl. When the days and nights both look pretty much the same... for days on end... and they look like this -- and yes, the sky was this exact color of pink, I swear -- well, you need to get out. So when our friend and Yoga instructor, Beth, corralled another kind and generous friend, Peg, to teach a small group of us how to make Waldorf star dolls, we were in! The invitation said to bring treats and/or whiskey. I chose whiskey - well, technically bourbon. Thankfully, others chose to bring treats. Peg spent a LOT of time in preparation for this class, marking out and stitching pattern pieces, gathering equipment, etc. I am totally envious of her fabulous sewing box and if anyone knows where to find me one like it, shout out! The little doll we will be making is right there, dressed in blue. And here's another little doll she brought that I'm also dying to make and fill the body with lavender and buckwheat. Now Peg assured us that the process was pretty simple. It kind of is. But simple almost never means easy... it does take a while... especially when you're having fun. Since we only got as far as making the little heads on this occasion, this will NOT be a tutorial... yet. Once we get it going, we'll do that. But if any of you are like me, and look at these little dolls and think, "well, I could make THAT if I just knew how they did the head..." I'll show you some of the steps. The first thing you'll need is this little tube of knit fabric and you simply cut off about 6" of it and tie a very tight little knot at one end and set it aside. Interesting bit about wool fibers - they have little barbs. When you add friction, like agitating your cute sweater in the washing machine, the barbs lock together and the wool is "felted" (and your sweater is ruined). Using that fabulous bit of information, we take a felting needle - warning, these things are SHARP - and poke, poke, poke, poke into this little wool ball head. As you poke, the barbs will lock and the head will become smaller, and more firm. The little foam block helps you to not stab yourself. I highly recommend not stabbing yourself. So there are several more steps to producing this little doll's head, which you can see a bit of in the rest of the photos - and if you are REALLY interested, we'll create a more detailed post, so please comment and let us know. Mostly, I like the images of all these women's hands, creating something that is unique and wonderful - each little head is the tiniest bit different. One head is smaller, one has blue eyes, one has a crooked smile. Like each of us. Can't wait for the next Craft Night. Thanks again to Beth and Peg and everyone who was there to make a snowy winter night into something warm and wonderful. Yeah, so it's Maine. And it's Winter. And it's snowing. While the grandson and I are fairly cozy in the house, Frank is about to pull his hair out. I can appreciate the frustration of plowing out trails in the deep snow only to plow them out again the next day... kind of like doing laundry and dishes... for Giants... And due-to-deliver-a-human-being-in-one-month Maddrey is also out galavanting around in the snow (shoveling paths and doing more than your average, reasonable pregnant gal would even consider) But finally last night, I got to tag along while Frank took food down to the cows in the lower pasture - in snowshoes. The snow in that part of the pasture would be about waist deep, but with the snowshoes, we only sank to about mid-calf. It was exhausting and beautiful and I still love Maine. Our little road stays fairly clear, thanks to the fabulous guys who drive the snowplows at all hours. The banks are a good two feet higher than this now. And we have another big storm coming tonight. I took this photo a couple of days ago. Today, this chair is COMPLETELY covered and then some. Yeah, that's a door... that we can't open for a while... And this is our living room window. Meanwhile, we're still working on the kitchen redo (more photos to come). Oran has already claimed his "hidey spot" in this cabinet. Alas, the cabinet doors to come will kill his dream - or possibly make his hidey spot better... Maddrey is knitting up a storm (photos to come there, too) to prepare for the New Baby due in March, but also poring through the seed catalogues to plan the 2015 garden. That's what winter is good for really - planning. It's that time Nature has set aside for us to think, to slow down, to watch the snow and contemplate the beauty of it all. The snow has been going nonstop since morning, blanketing the ground, the cars, the hoop houses in the garden... well, everything actually. It's beautiful and makes some chores easier, oddly enough, because we can drag things in sleds. (I use the Royal "we" meaning mostly Frank and Maddrey. THIS "We" stays in the house with the grandbaby). But the cow and goat still get milked and we still need to filter the milk, scoop off the cream after it separates and jar it up. When we have enough jars, like we do today, we make beautiful, fresh butter. Really, the blender is the only part where we "cheat." It's basically extremely fast churning... You still have to watch it carefully. Not too much so it effectively melts onto itself and not too little so it's merely whipped. Like right here - this is just whipped. Where as this (below) is butter-ish. You'll see it change color just a tiny bit, from Milk White to Butter Yellow - only not the store-bought Yellow, the Real Butter Yellow. It's much more gentle. Pour it through the cheese cloth (you'll have placed a bowl underneath to catch the genuine Buttermilk, which you will use later for Genuine Buttermilk Biscuits). Then you PRESS out the extra liquid. Press and press and press. Got it all pressed out? Now you rinse it with cold water till it runs pretty clear. You want to get all the excess milk out so it keeps longer, as I understand it. Put it into a bowl and PRESS some more. See that little bit of liquid still coming out? Get that out of there. I am certain that our two kitties - Purrrcival and Purrrscilla - would not consider their day an adventure, but they did get to travel, and have new experiences. Although they did both return home... um... "missing a few parts." Our kitties are now spayed and neutered and will have happy, safe lives and not contribute to the massive over-abundance of pets. We wanted to thank the wonderful Staff at Community Spay-Neuter Clinic in Freeport, ME for their beautiful care. We brought the kitties to Bangor VERY early in the morning and delivered them to Pete, who was his own one-man show, juggling clipboards and pet carriers in the snow. The Clinic offers FREE transport with several pick-up points. Maddrey was admiring their suturing, but was also very impressed with the kitties' new tattoos - a little green dot on their tummy - indicating that they had been "fixed." This is genius, since you can't tell except by "opening them up" if a female has been spayed - and sadly, some animals have to endure this unnecessary surgery if they wind up on the streets (our won't!) and then in the custody of Animal Control (who are really just doing their job). See her little green dot? Purrrcival is winking because he feels so good even without his "bits." Please please do encourage everyone you know to be Responsible Pet Owners - this great clinic makes any excuse impossible. And if you'd like your children to witness the birth of an animal, visit a FARM! If you'd like them to have the opportunity to play with newborn puppies or kittens, visit ANY Animal Shelter - and take one HOME! By the way, the Clinic does have a Wish List (office supplies and blankets, easy stuff to donate) and they are about to expand to cover more of the State. Check 'em out and let's support their great cause and work.